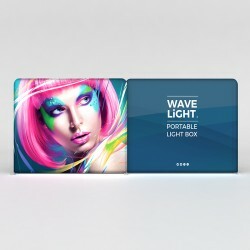 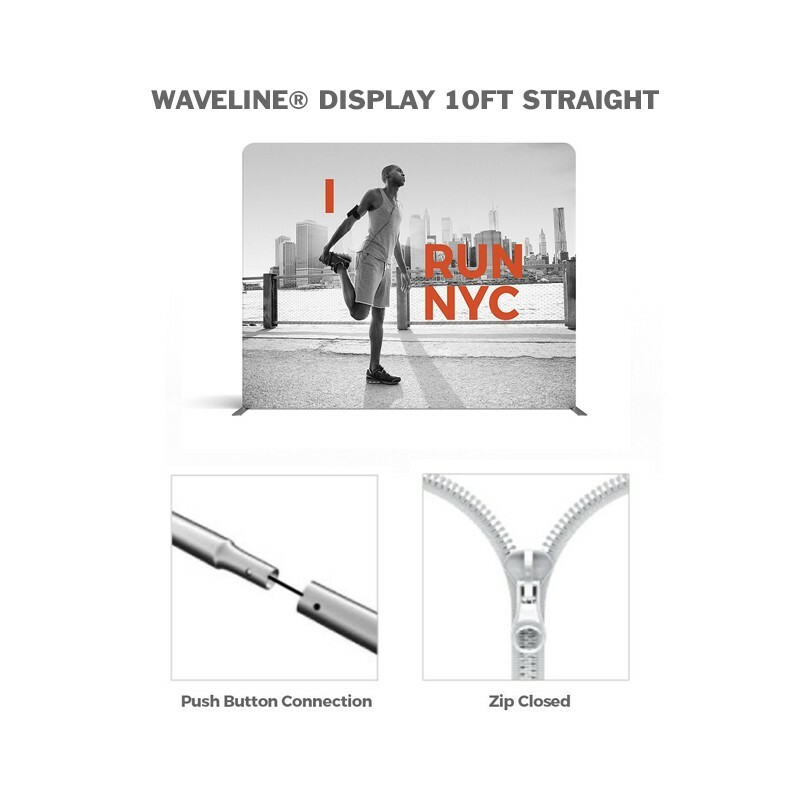 The New WaveLight® Backlit Displays are one of the thinnest tension fabric light boxes to hit the exhibit market. 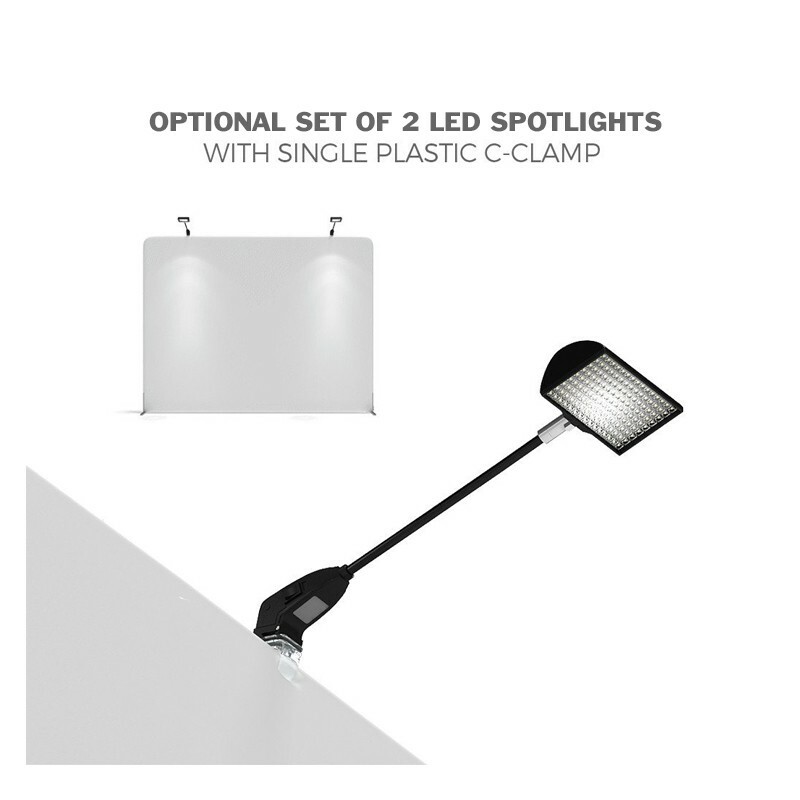 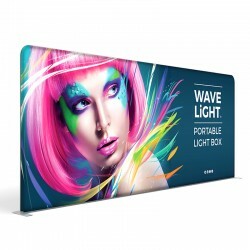 Within just a 50mm aluminum pipe profile (two inches), the WaveLight® frames an array of perfectly positioned LED lights to achieve an ultra-bright, evenly-diffused backlit display –making everything on the graphic look more brilliant and vibrant. 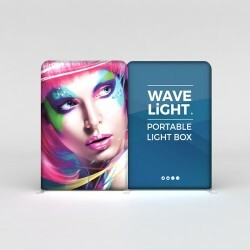 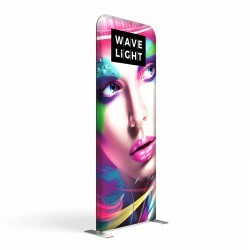 The 5ft WaveLight® Backlit Graphic is a single-sided, wrinkle-resistant, dye-sublimation fabric print with Heise™ total blockout fabric on back. 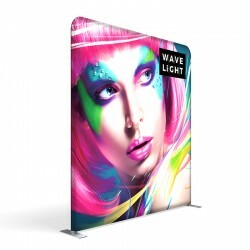 The fabric graphic snuggly zips around the frame and lights, which provide tension for a smooth finish. 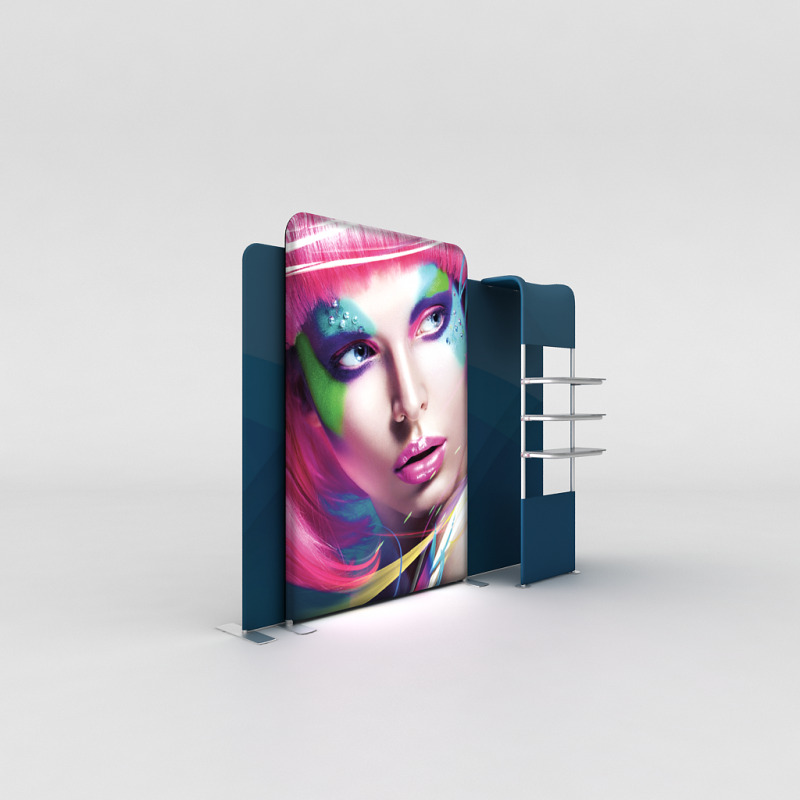 A zipper on the lower back of the blockout fabric provides easy access to the lights and running power cables. 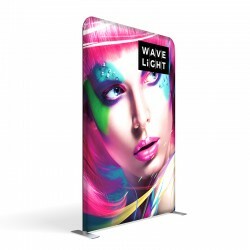 The 10ft WaveLine® tension fabric display is a great alternative to standard pop up back wall displays. 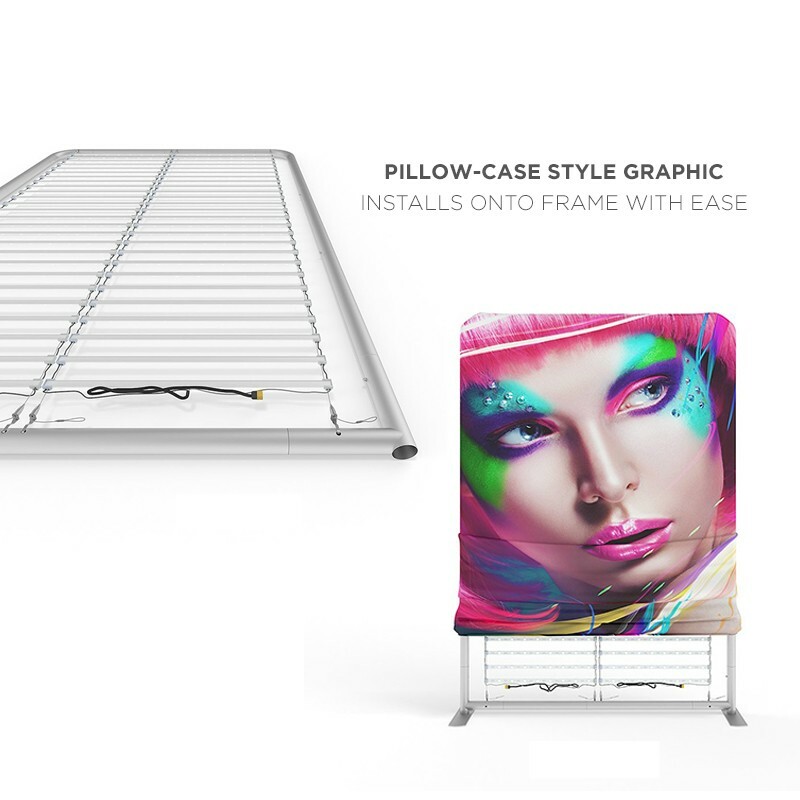 Lightweight aluminum poles with bungee cord snap together to create the base framework, then slide on the pillowcase-like graphic over the frame and zip it closed at the bottom. 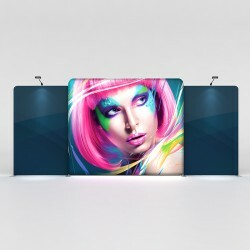 The zipper is hidden from view and tightens up the stretched fabric graphic for a smooth image. 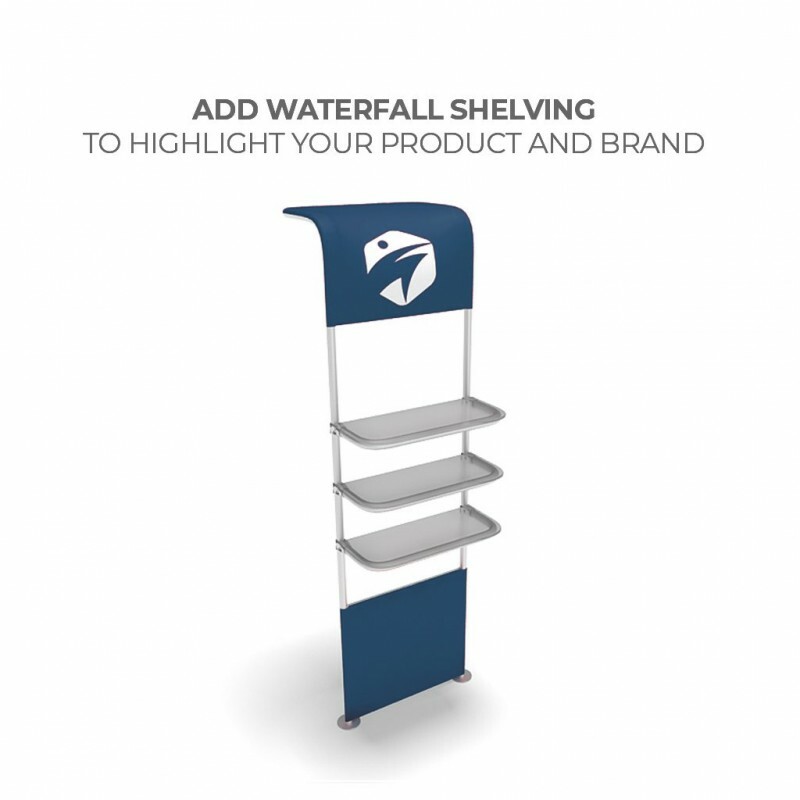 The WaveLine® Waterfall is a great add-on shelving solution for any event and trade show displays. 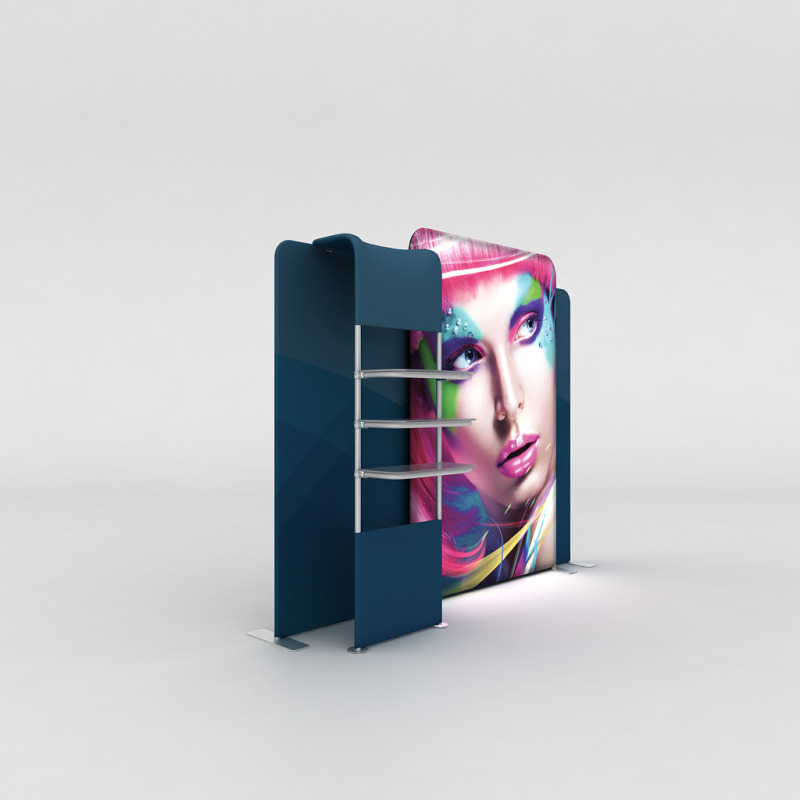 The display unit features 3 shelves that can support up to 9lbs each. 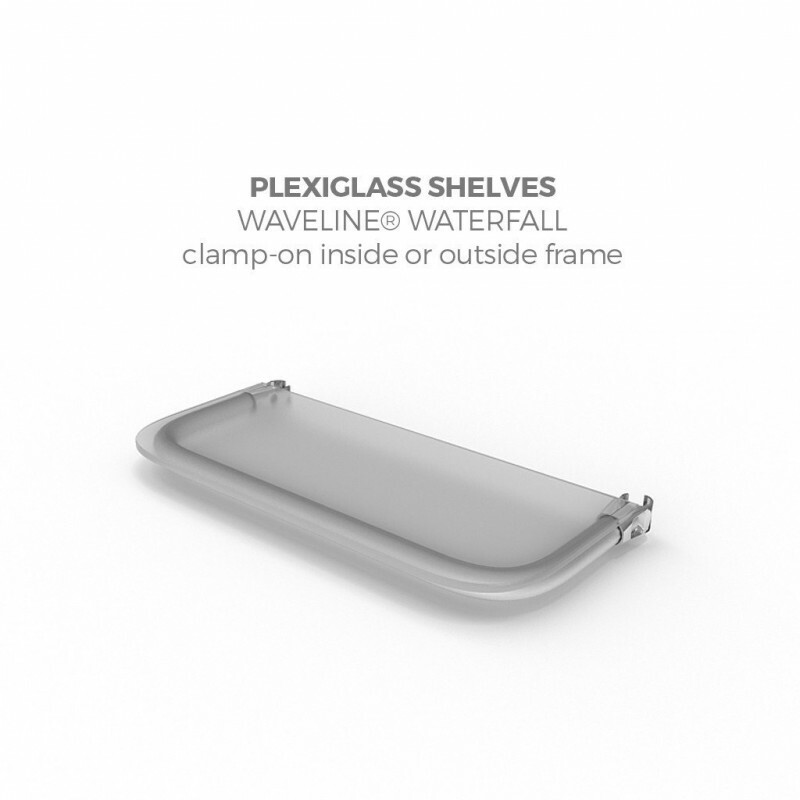 The shelves can be placed at different heights and clamp-on the inside or outside of the frame. 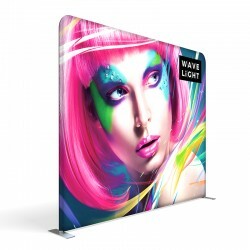 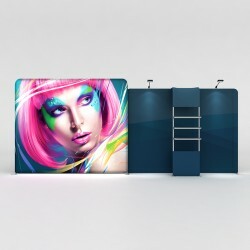 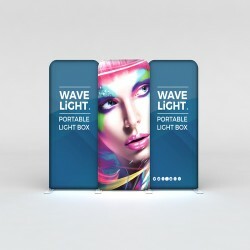 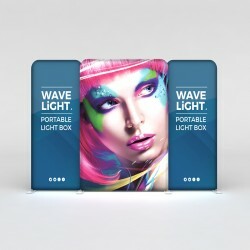 Enhance the WaveLine® Waterfall stand alone frame with custom zip-on fabric graphics to create a branded look. 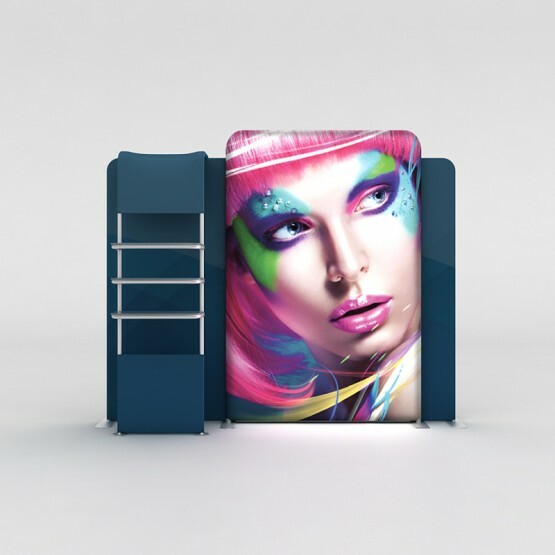 *Graphic Storage Tips: For storage of tension fabric graphics it is best to fold them with the graphic facing inward and store in a sealable plastic bag. 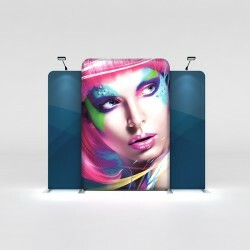 Spot clean graphics by wiping with a damp white cloth. 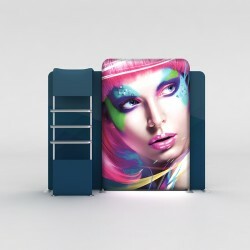 If washing becomes necessary, use a commercial size washing machine, gentle cycle with cool water and line dry flat. 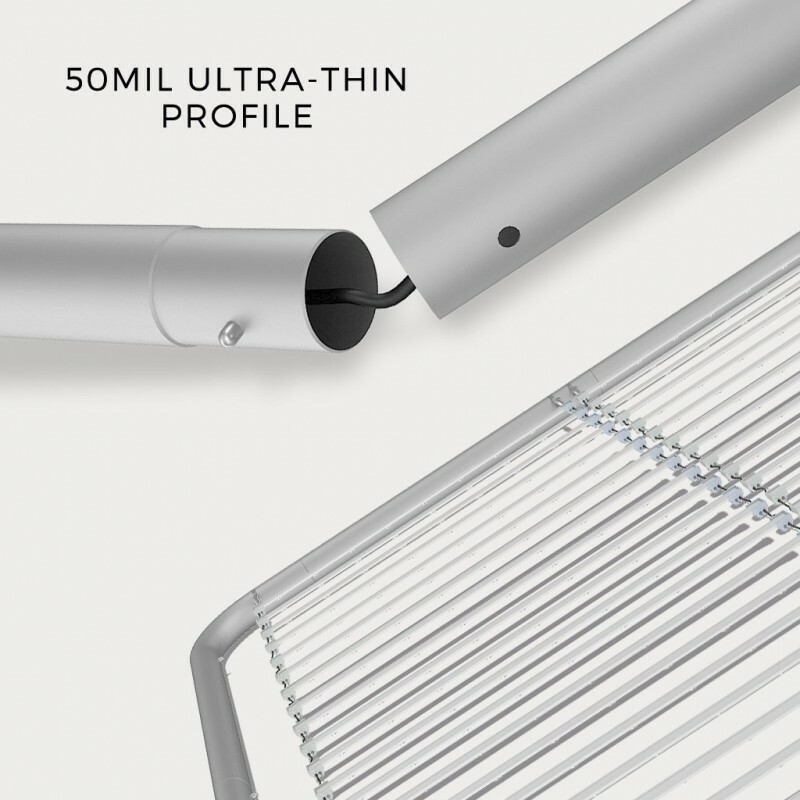 Dry cleaning is not recommended to prevent shrinkage.